Yesterday, I headed out for a full day's fishing the Cheesman Canyon of the South Platte. This section is rated a Gold Medal water by the CDOW and artificial lures and catch and release only is allowed. I picked Cheesman Canyon because I finally wanted to give my Amago a shot at some bigger fish than those I have caught during the season with my Iwana 12ft. Because of the above mentioned regulations and the constant supply of food, particularly midges, the trout grow big and fat and are used to see a lot of anglers all year long. I believe an average fish in the Canyon is somewhere in the 18" range. Cheesman Canyon's fishing is outstanding but very "technical". Most of the time, you will be limited to fishing nymphs and midges, small sizes of 18 or 20 and smaller. There are of course days when you can trick them into taking dries and bigger patterns, but those days seem to me to be far and between. Yesterday was another of those Colorado blue sky days, not a cloud and high 60ies - not bad for mid October. I met my new friend and Tenkara fellow Jason Klass of BackpackFlyfishing.com just before 8am at the trailhead of the Gill Trail which is the only way to access the Canyon. When I got out of the car, I was greeted by chilly 26F which made the change into my waders not really a pleasure. We hiked in a bit, past Cow's Crossing, had a little snack, waited for the sun to crest the canyon ridge and setup our Amagos. I rigged my Amago first with a no. 3 level fc line from Tenkarabum, a size 18 copper john and a size 20 mercury RS2 (my lazy version of it) as the point fly. When I nymph, I always fish two flies; an attractor and a smaller imitative fly. Later that day I switched to a furled line yellow hi-vis 13ft line of StreamsideLeaders. Fishing was initially somewhat slow and it took a while for the sun to do it's work. I got a few hits but wasn't able able to set the hook properly or lost them right away. Finally, after a while, I landed the day's first Cheesman Canyon brown trout. Smaller than average, but hey, a trout landed is a trout landed. I fished all day with the same two flies, loosing one RS2 only to rainbow that I would guess to be 16-17" that I hooked in pocket water adjacent to a nice ripping current. I was initially able to keep her away from the fast current but there is only so much you can do with an Amago. Once she hit the current, it took only seconds for her to head downstream and around one of the huge boulders that are typical for the Canyon. She's got now a nice little lip piercing. The highlight of the day though, at least for me, was a pocket of water that really did not look like much and I almost passed up. Only because Jason was fishing just a bit ahead of me and I didn't want to pass him, I decided to fish the pocket. I cast into the head of the pocket and was surprised when I saw my indicator (yes, I do use an indicator even with Tenkara...) DART away. I was hooked into a very nice fish, in the 15-16" range but alas, the hook dislodged and all I could say was "see you later...". I recast into the same pocket and hooked another fish which I never saw, but by the feel of it, definitively smaller than the first one. Being the optimist - or opportunist - I cast again into the same pocket, let it drift and hooked the third fish out of the same pocket. This one was right on the seem where the slow/still pocket water met the faster current. I was very surprised by the weight I felt and when I saw the fish's flash I knew I was in trouble. The biggest fish so far fishing Tenkara... She didn't go crazy or went for a run, but kept changing positions from the slow water to the faster water, staying deep. She then let herself drift downstream with the current, still not running. In the shallower water I finally realized what I had on.... a beautifully colored rainbow trout, her purple flank flashed brilliantly in the sun light. She was, in my eyes, well over 20", my "educated" guess would be in the 21-23" range (I caught on regular fly fishing gear a few in the 21" range, measured, and this one seemed to be bigger than those) . I called out to Jason that I might need some help netting her. His comments was, quite dry: "She will not fit your net...". She still did not go crazy nor did she go for a strong run, so when we moved her (and Jason) into position to net her, she gave a shake with her head and the fly came off... I was so excited having caught her and coming so close to netting her, that I initially wasn't even bummed that she got off. Only later I was a bit disappointed that I couldn't get a mug shot of her and me. I was very pleased and happy how I was able play her with the Amago, but I think that she also did not really give her full 100%, maybe just 50% or so. Those big trout in the Canyon have been hooked more than once during the years it took to grow so large and I just can't shake off the feeling that she knew that she'll be let go, once more. I continued fishing, picking up a fish here and there but by no means was the fishing hot in terms of numbers. Each fish was hard earned by placing good dead drifts, line management and depth control. Your usual fare fishing what people call "technical". Towards the end of the day, I helped Jason to shoot a quick video for a product that he was testing and shortly thereafter we started to hike out. I gave that "special" hole another shot, this time with no success. I hooked another small fish on my way out, then changed to a dry (Snowshoe & Elk Caddis) since I saw several size 16 grey caddis flutter around. No risers, no hookups (I couldn't even see a fish), but I decided to blame it on the wind that made it difficult to cast and place the dry appropriately, lol. Happy and exhausted I completed the hike out of the Canyon, drove back to home & family and a few cool ones. I am extremely happy with the Amago, knowing what size of fish she can handle, with the day, the fishing and the company I had. This was a GREAT day of fishing. Great Post. It was fun fishing with you and I had a great time even though you caught all of my fish! ;) It's too bad about losing the big one. Next time we should definitely bring a bigger net. Very nice post. Between your content on here and what I read over in the various forums, you've definitely become one heck of a tenkara devotee. Great to see such enthusiasm. P.S. 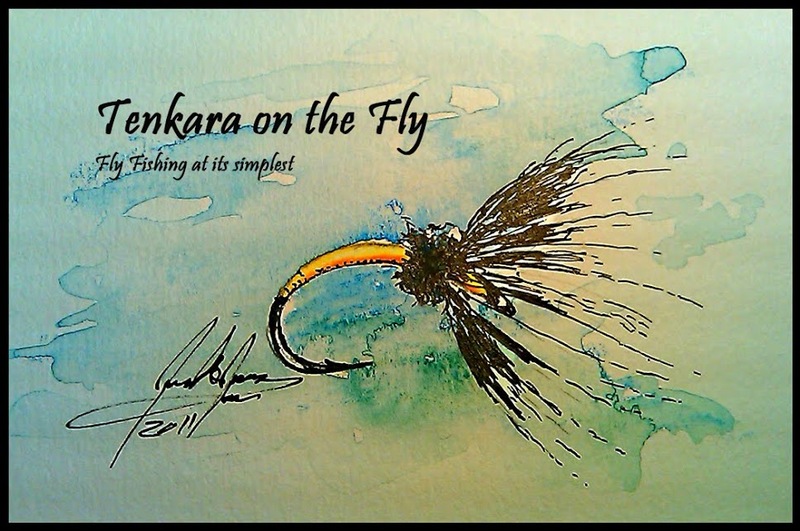 I added you to my blogroll, us tenkara folks got to stick together. Thanks for the kind words, troutrageous. I also do enjoy your blog and post.s It's nice to see what experiences other have while enjoying our sport. Tenkara is fairly new to me but has already become a fixed part in my fishing.